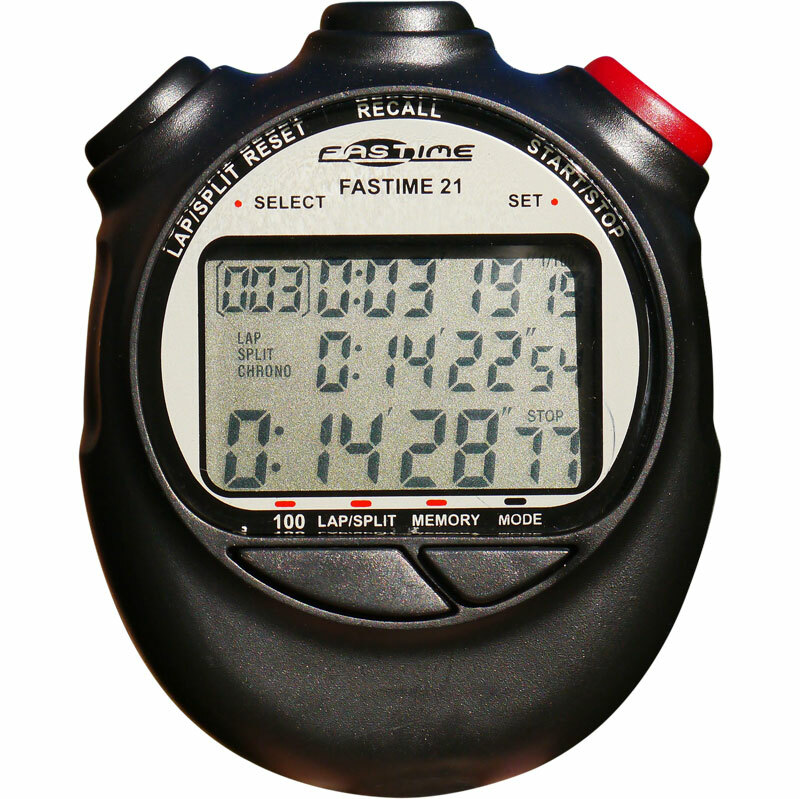 The Fastime 21 Stopwatch is a 100 lap triple display stopwatch. Stopwatch, Repeating Countdown Timer, Pacer,Time of Day and date, Alarm. Stopwatch: Measures to 9hrs 59mins 59 secs 99/100th sec. Triple display shows:Cumulative split and Lap split times to the previous split taken. Bottom display shows cumulative running time. Lap number is also shown. Up to 100 cumulative and lap split times can be stored in memory. With fastest, slowest and average lap times shown. Time out (start,stop,resume) function is also included. Repeating Countdown Timer:Maximum setting 9hrs 59min 59sec. The display shows the target time, the counting down time and the number of repeat counts. The timer counts in 1/100th second. Pacer:The pacer value can be adjusted between 10 and 320 counts per minute. The display shows the target count per minute. Use this function to set and measure a required number of actions per minute. Pressing the split button increases the target time per minute. Time of Day/Date: Shows time of day (12 or 24 hour display option), date month and year. Alarm:Shows Alarm set time, date month and year. It's a nice and easy to use stopwatch, I haven't used all the functions yet, but the stopwatch is fine for timing races. It doesn't have a battery level indicator which is a shame. I bought these watches on behalf of my kids swimming club. They are the same as the one i own , which I find easy to use and hasn't let me down.